Please call me to schedule a visit to my home gallery. 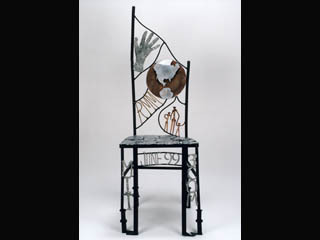 MIT on the chair's right leg designates the institute of higher learning that has been the educational starting point for many of the greatest contributors to the advancement of technology, including Dr. Metcalfe. 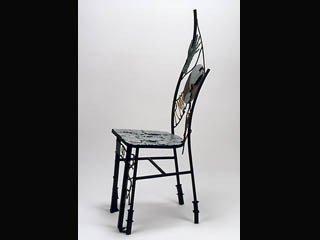 The 3Com lettering on the other leg of the chair speaks of the computers, communication and compatibility made possible by 3Com and advanced research made possible by the 3Com Founder's Chair. RMM, Dr. Metcalfe's initials, represent his accomplishments made visible, and are a mark of honoring his education at MIT. The globe represents the worldwide connectivity resulting from the inventions, technology and products of Dr. Metcalfe and 3Com. The hand is reaching upward toward the unknown universe, representing the inquisitive nature of academic research. The human figures represent the more than 200 million network connections enabled by 3Com and Dr. Metcalfe. They also serve as a reminder that networking technology is about bringing people together. The seat of the chair lists some of Dr. Metcalfe's degrees, awards, honors, inventions, memberships and activities. The month and year commemorate the date of this presentation. 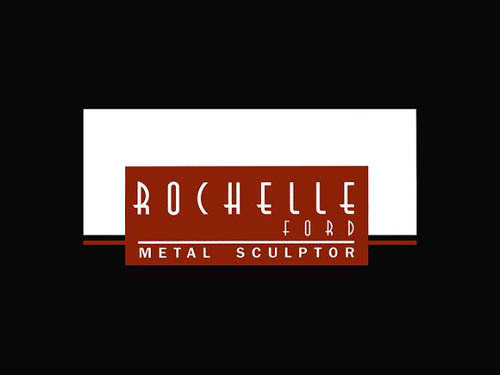 Rochelle was commissioned by 3COM founder, Dr. Robert Metcalf, to make a chair sculpture commemorating the Professor’s chair he endowed at MIT. Pictured with Rochelle is the first recipient of the award, Tim Berners-Lee, the inventor of the World Wide Web.